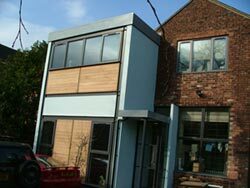 Extension and Alterations at The Alexandra Practice, Manchester. A high class extension to a Doctors Surgery and extensive internal alteration carried out with minimal disruption to a very busy practice. Comments:- Helpful and friendly team. Accommodated client’s suggestions and amendments without difficulty. Good workmanship. Marlborough House Bolton. Completed July 2008. 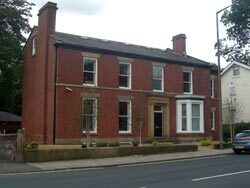 A very large Victorian dwelling converted into high class regional offices. Extensive internal refit to the clients designers and project managers requirements with many traditional features including sliding sash windows. Comments:- Good quality, on time and cost with good liaison throughout. 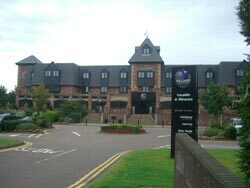 The Village Hotel Warrington. Projects completed 2007 to 2008. Refurbishment of the Health & Beauty Salon. 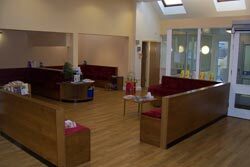 Refurbishment to Leisure Reception, Corridors and re-tile floors to changing rooms. Refit to Conference & Banqueting Suites. Complete refit out to Public Toilets. Comments:- An honest straight forward approach throughout, exceptionally straight forward to deal with. 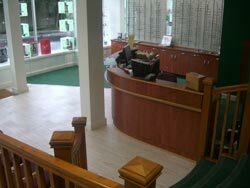 Complete Refurbishment of Crowther Optometrists, 29 Market Street, Bacup. Completed December 2007. Refurbishment of the1st & 2nd floors from dilapidated unusable space to consulting rooms and staff quarters. Ground floor extensive refit to shop accommodation, display areas and consulting rooms. Project Manager and Architects Equilibrium Architects Limited. Comments:- Derek De'Ath’s work is of a high quality and the management of the project on site was excellent. Doctors Surgery Earby, Lancashire. Completed May 2008. Extensive refurbishment to waiting area, offices, consultant rooms, lift installation and disabled adaptation works. Project Manager and Consultant G B Consultancy Limited. Comments:- Well organized contractor providing good quality project. Will be included in future tender lists.